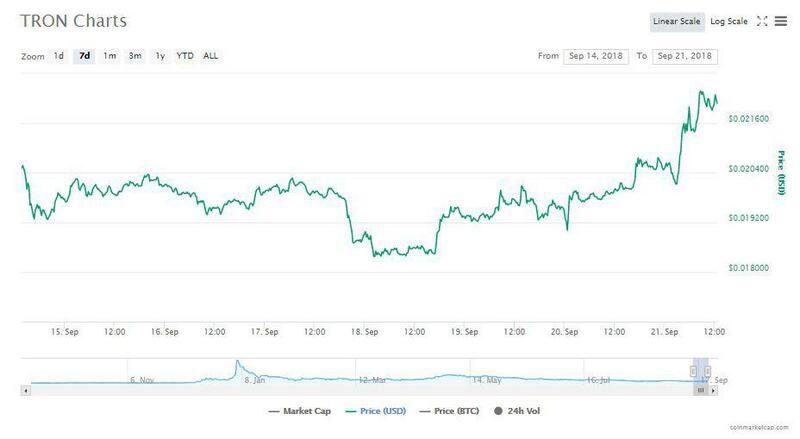 The market opened on Friday, 21st September, favoring altcoins which were on a startling bullish run. Surveying just the top 10 cryptocurrencies, Stellar Lumens [XLM], Cardano [ADA] and Tron [TRX] saw double-digit rises, out of which Cardano was the biggest gainer, just behind XRP. 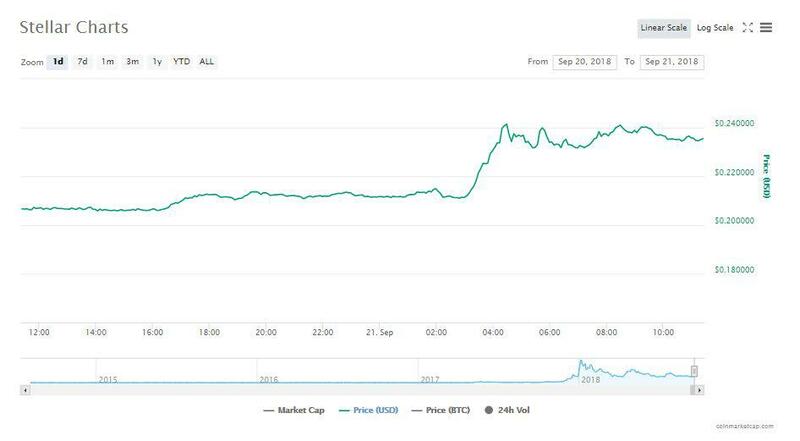 Cardano [ADA] has seen a significant climb of 19.15%, a stark difference to last week when the market was in the bear’s grip. At the time of writing, Cardano was trading at $0.083 with a total market cap of $2.171 billion. The majority of Cardano’s trade occurred on UpBit, occupying 34.90% of the entire trade volume. The cryptocurrency’s rise comes in the wake of the news that it was being listed on OKCoin along with Stellar Lumens and XRP. Stellar Lumens [XLM], at press time, was trading at $0.234 with a growth of 20.47%. The cryptocurrency was holding a market cap of $4.14 billion, an increased amount on the back of a 13.94% weekly rise. The majority of the trade volume of XLM was held by Binance, with the XLM/BTC pair occupying 27.35% while the XLM/USDT pair held a 16.31% quota on the exchange. Some market speculators believe that the rise of XLM can be attributed to the recent reports of the cryptocurrency being listed on OKCoin. Stellar has been creating a buzz in the cryptosphere following the announcement of Lightyear, a global ledger that aims to provide asset management capabilities. 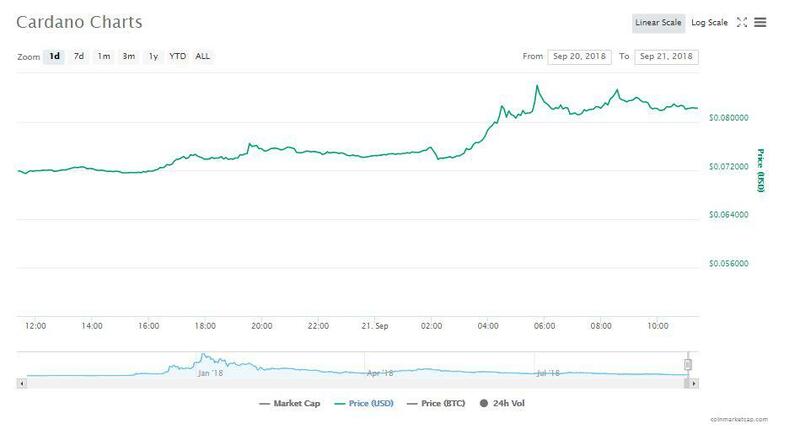 Another cryptocurrency riding the bullish wave was Tron, which was trading at $0.022. At the time of writing, the cryptocurrency was rising at the rate of 15.74% with a total market cap of $1.457 billion. Just like Stellar Lumens, most of Tron’s trade volume came from Binance, where the TRX/BTC pairing held an 11.91% majority. In addition, the coin was recently listed on KuCoin and BitBay. The coin was also listed on Bittrex with a USD pairing, marking it as the first fiat pairing in the US. Moreover, Tron Foundation announced that there will be more announcements in the coming weeks regarding the projects developments.